With school having finished I have had a ton of free time on my hands...but I'm not complaining. I was able to have an amazing dinner with some friends, see the The Fault In Our Stars (this was the first time in a while that I cried during a movie), write a few blog posts, and I'll be spending a week at my friend's beach house starting Sunday! 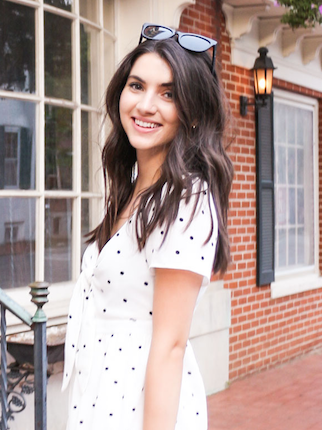 For my summer day to day look I tend to keep my outfits simple and laid back since I'm usually out running errands, grabbing a quick lunch, or babysitting. Jean shorts have always been a summer staple of mine but I seem to be drawn towards the boyfriend fit and distressed look as opposed to shorter and tighter ones. These J.Crew denim shorts are the perfect length and the pattern is so simple yet whimsical. Blue seems to be a reoccurring color in my closet so this top is a perfect option. It has a sharp, clean, and classic feel but the shape is so modern and chic. A comfortable pair of casual sneakers are a must have for everyone. I love these Nike's that J.Crew carries because they're comfy and fashionable...I would wear them with jeans or a simple striped shift dress! This Madewell bag and pink pair of sunnies are too cute and perfect accessories for the outfit. I can picture myself wearing this out to lunch and fro-yo in town then stopping by the farmer's market for fresh flowers. What's your go-to day to day outfit?